Traveling to China with kids? China is such a great land, where should you go? what is there to do with the children? what's the best way to get there and around? We try to answer these questions in the following pages, as well as give you some ideas of what has worked for us when traveling with our kids in China. Plan your family-friendly itinerary to include a Pedicab trip through the Beijing alleyways, a Toboggan ride down the Great Wall, biking through the countryside among gumdrop mountains... planning a trip to China with the kids will take a little more work, but in the end, it's all worth it! Yes, China is BIG, and there is so much to see and experience. This is one of the world's ancient civilizations and is so full of history and culture. When all that history and culture becomes "too much" for the kids, take a boat ride, fly kites, watch a kung fu show! The Great Wall is of course a "must" when visiting China. Kids will enjoy climbing the watchtowers, but they will looove toboganning down this historical site. There are many sections of the Wall that can be visited, some offer cable cars, toboggans, and roller coasters... check them out and decide which one to visit. Xian's claim to fame is the Army of Terracotta Warriors, a most intriguing archaeological discovery. But there is more to Xian than the Terracotta Army. 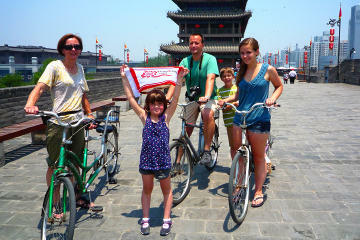 Kids will enjoy riding bicicles on the ancient city wall, visiting food markets, musical fountains and more. Shanghai is the nation's business and financial center. A place where East meets West, old meets new... One of the world's most vibrant cities. Visit our sister website for more on Travel Hong Kong Attractions and Landmarks . Children will enjoy a bike ride through the countryside, or cruising the rivers on bamboo rafts... it's a great place to get away from the hustle and bustle of the big cities. The Yangtze River offers charming mountain scenery at the Three Gorges and the largest hydroelectric project at the Three Gorges Dam where crossing the locks was a highlight. A visit to an ancient ghost town is on the way, and riding the peapod rafts is also great fun. Chengdu you will see Pandas as close to their natural habitat as you can get, a great treat for the kids to come face to face with one of these wonderful creatures. Chengdu is a good place to use as a base for exploring the nearby area and is also the gateway for travel into Tibet. Guangzhou: This bustling city is a mix of traditional Chinese structures and ultra-modern skyscrapers with an ever-changing skyline. Riding the bubble tram atop China's tallest tower, a fantastic world-class circus, and a very unique safari park give kids and families plenty to do at this mecca for trade fairs and exhibitions. Leshan boasts some beautiful countryside as well as the world's largest Buddha, a UNESCO World Heritage Site. Kids will enjoy climbing down to Dafo's feet and having a picnic on one of the gigantic toe nails! Several places in China claim to be the model for the beautiful floating mountains featured in the movie Avatar. Both the peaks of Zhangjiajie National Park and the Chinese Mountains at Huangshan are the biggest rivals. Besides the jaw-dropping scenery, there are plenty of activities for the active families like hiking and rafting. Yunnan Province is China's South-West jewel, with an incredible variety of striking landscapes, ethnic cultures and wildlife. It claims to be the home of fabled Shangri-La, from stone forests, snow-caped mountains, deep ravines and rice terraces, Yunnan has been blessed with some of the country's most spectacular scenery. Is it OK to travel to Tibet with children? Here are some answers about altitude sickness, strong sun, food, Tibetan dogs, and alternative family-friendly choices to experience Tibetan Culture. What about traveling to the more remote areas of China? Some "off the beaten path" places away from the main tourist sites that can be visited with children? The Great Wall on the North Korean Border: no crowds, beautifully restored. Use this link to the China Map for a quick reference when planning your itinerary! Check out these China Travel Guidebooks and start planning your destinations!